THE WRITING BUDDHA - Opinions | Books | Movies: Honesty works better than Skills And Talent!!! You must have heard a lot from people that to achieve success in your life you need to have great talent or skills or the combination of both. Absolutely, Yes! One needs to have good skills in a field to project himself relevant for a specific type of work. Until and unless, you aren't master of something or even close to being the perfectionist of your work, your survival becomes very difficult and life becomes cruel-some after a point of time. But you would say that you have seen people in life who aren't that great in their work or work-style but still do better than the ones being very smart and skilled. Even I used to get confused seeing such people do well in life or at least survive in this competitive world somehow where coming even 2nd is not acceptable. When you are honest in whatever you are doing, at least with yourself, you tend to grow as faster as others who are performing well. I have seen that I have achieved many things in life not because I am very brilliant in my work but just because I have been honest with myself and my work. I have hosted almost all the events in my Post-graduation. Am I a very brilliant anchor? Definitely, not! Then what made my college committee come to me each time before a function? They knew that whatever I shall do on the stage, it would be my best that I would be trying for them and I won't try to pull them down by saying or doing something that might go against them. Similarly, I was made Class-Representative all of a sudden in the final year of PG. Was I the most studious person in class? Was I the person who always made sure that teachers loved me by telling them secrets of the class? Never! Just because my class-teacher used to see my conduct in classroom that whenever I studied I did it with full honesty and similarly even when I slept in classroom, I would be very frank to accept it. This made her believe that even if something big would go wrong in classroom tomorrow because of me or my decision, I would accept it as it is without worrying about its repercussions. Even in job, I am assigned the tasks on and off which aren't something that's part of my profile. Someone else must have directly said no to it. But I make sure that if I am saying yes, I am going to give my best shot to it even if that's just 5% of what my senior must have expected out of me. But when I am doing that particular work, I do as if that's my primary work and even a small glitch is unacceptable. And if something goes wrong in any small work, I openly accept that I missed out the point. Today itself, I disclosed it to my senior that I am not sure about the module I am testing as I feel I am able to create only 12 scenarios when I know not less than 20 can be tested. They didn't insult or ridicule me. They accepted that I am not the best person at work but they know that whatever is possible for me, I am giving to it. P.S. : I would like to share one more example in the end: A person who says that he knows everything in an interview gets rejected while a person who openly tells to the interviewer that he have never tried that part of work ever in his career gets selected. It's just because Interviewer knows that the latter is being honest and not lying just to get his dream package and dream job. Haven't you heard of such cases? You have, isn't it? 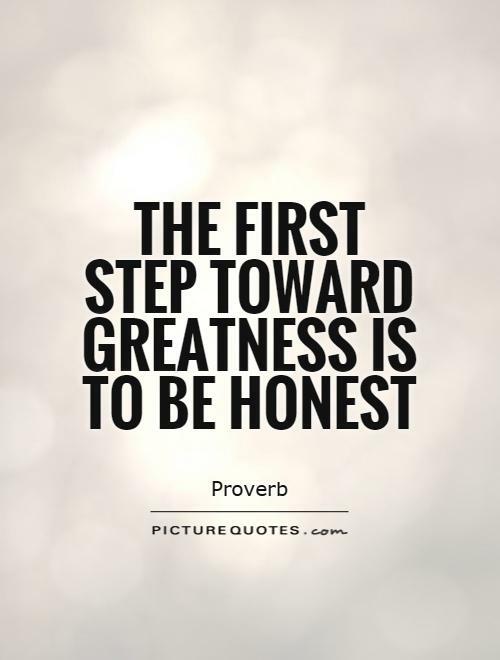 So just start being honest to unlock many such achievements in your life.